The years 1920–1970 saw revolutionary change in the character of the monetary system as a consequence of depression, war, and finally prosperity. The same years saw equally revolutionary change in the character of economic ideas as the rise of statistics, Keynesian economics, and then Walrasian economics transformed the style of economic explanation. The two lines of change reinforced one another, as monetary events posed new questions that required new conceptual approaches, and as monetary ideas suggested possible directions for monetary policy. 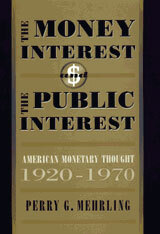 Against this background of change, Perry Mehrling tells a story of continuity around the crucial question of the role of money in American democracy, a question associated generally with the Progressive tradition and its legacy, and more particularly with the institutionalist tradition in American economic thought. In this story, which he tells through the ideas and lives of three prominent institutionalists—Allyn Young, Alvin Hansen, and Edward Shaw—progress is measured not by the swings of fashion between two polar traditions of monetary thought—quantity theory and anti-quantity theory—but rather by the success with which each succeeding generation finds its footing on the shifting middle ground between the two extremes. More than a simple history of monetary doctrine, the book makes a case for the continuing influence of a distinctly American tradition on the evolution of economic thought in general. In this tradition, monetary and financial institutions are shaped by historical forces and adapt to the changing needs of the economy.